So how winnable are those 42 seats? The likelihood of many Labour voters from 2015 switching to the Conservatives in 2017 is small, so the Conservatives will have to gain most of the extra votes from other sources. One likely source is those who last time voted for UKIP. Polls currently suggest that as many as half of those UKIP supporters might vote for another party in 2017. The most likely beneficiary of such a shift would be the Conservatives, who are implementing what UKIP supporters wanted – the UK’s exit from the European Union. But will that be enough? This graph shows all of the constituencies won by Labour in 2015 with the Conservatives in second place and a Labour majority of less than 20 percentage points. These are arranged along the horizontal axis. On the vertical axis, is the percentage of votes won in those constituencies by UKIP. In those constituencies above the red diagonal line, UKIP’s vote share was greater than Labour’s majority over the Conservatives. Of the 80 constituencies shown, in only 21 (those below the red diagonal line) was UKIP’s vote share less than the Labour majority. Some three-quarters of the seats shown are therefore vulnerable for Labour if a substantial proportion of UKIP’s 2015 supporters switch their allegiance to the Conservatives on June 8. Of course, some will remain loyal to UKIP, but in many of those constituencies the potential threat to Labour is great. Now look at the 42 seats to the left of the vertical line, where Labour’s lead over the Conservatives in 2015 was less than ten percentage points. In only three of them was UKIP’s share less than that majority, so even if all of UKIP’s supporters switched to the Conservatives in Harrow West, Westminster North, and Tooting, Labour would still beat the Conservatives (assuming no other change in voting patterns). In all of the other 39 seats, UKIP’s 2015 vote share was larger than the Labour majority. Let’s assume that UKIP retains the support of 7% of the voters in each of those seats, with the remainder switching to the Conservatives. Then all of the constituencies above the dashed purple line are vulnerable – 34 seats where the Labour-Conservative majority was less than ten percentage points. Of course, not all former UKIP voters who desert that party will switch to the Conservatives. Some may abstain and others may transfer to another party, even to Labour. So let’s assume that in each of the constituencies 14% of those who voted UKIP in 2015 either remain loyal or do not switch to the Conservatives. This still leaves 20 seats (above the dashed orange line and to the left of the blue vertical line in the graph) where if the remainder switch to the Conservatives, Labour will lose unless they win more votes from other sources. A switch of 20 marginal seats from Labour to the Conservatives as a result of many UKIP 2015 voters switching their allegiance would give the Conservatives 352 seats in the new House and Labour 215, and a Conservative overall majority of 54. 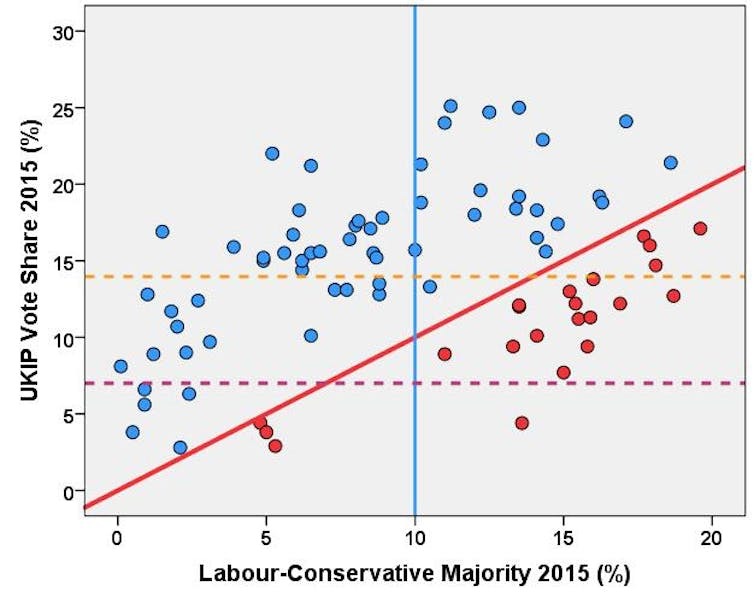 The Conservatives might also hope to win at least some of the seats to the right of the blue vertical line and above the orange dashed line in the graph, which Labour held with a majority of 10-20 points in 2015. At least a further 20 seats could switch from Labour to the Conservatives (one in Wales, one in south-west England and the rest to the north of the Watford Gap), especially in those seats where UKIP has decided not to field candidates because they think their absence might mean that a Labour pro-Remain MP could lose to the Conservatives. And of course the Conservatives hope to win as many as 12 seats from the SNP in Scotland, although a few may be lost in England to the Liberal Democrats. It is clear, then, that the success or failure of Theresa May’s gamble in calling an election to enhance the Conservative majority could largely depend on how those who supported UKIP candidates in 2015 vote this time around. There may be relatively few marginal seats being fought over by the Conservatives and Labour, but how former UKIP supporters vote on June 8 will be crucial to the outcome. And those battles will be fought far from London and the traditional Conservative heartlands. The views expressed here are personal views and do not reflect the views of the University of Bristol or the funders of the research. This entry was posted in Uncategorized and tagged Conservatives, GE2017, General Election 2017, labour, Polls, UK parliament, UKIP by policybristol. Bookmark the permalink.